The Versace label is renowned for a luxurious glamour that has always tip-toed along the cutting edge of sensual sophistication and edgy elegance. Versace eyeglasses are made with only the highest quality materials and are designed to reflect the urbane and impeccable taste of the style-savvy face behind the frame. Supple curves, clean lines, and truly fashion-forward styles are the hallmark of the Versace brand, and Versace glasses uphold the label's distinguished legacy. Due to manufacturer's restrictions, Versace products cannot be shipped to Australia. 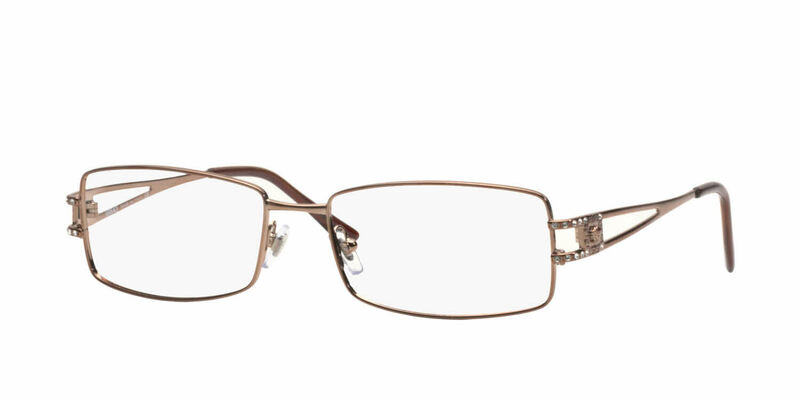 Versace VE1092B is a Full Rim frame for Women, which is made of Metal. These Versace VE1092B Eyeglasses flatter people with the following facial features: Thin Face. Versace VE1092B Eyeglasses come with a cleaning cloth and protective carrying case. I have worn my copper/bronze wire frame glasses for 3+ years all day every day and am totally satisfied w/them. I lost them last week at the store and so far they have not been turned in to customer service. I'm sick about that. The decorative stones are all still there and the frames have not discolored or chipped or peeled. I love them and will purchase again if they are still available. Within 4 months, 2 stones had fallen out of each of the side decorations. After 10 months, the finish had worn off/broken off the bottom of the left eye frame causing a rough and unsightly appearance. Wish I hadn't gotten them. The Optometry office said they couldn't order the same gold color as it had been discontinued; instead tried to give me a shiny bronze color [of a casket]...said they never should have been on the shelf -- it was the vendor's fault for not removing them before sale. I passed the offer; am still wearing the original ones because of the gold color, and they apparently cannot be repaired!